XSP arduino Programmer is designed for Arduino/AVR device. Support both ISP and FTDI. No driver software is required. It could provide both 5V and 3.3V power output or shutdown power output. Support Xbee socket and auto-match ISP clock frequency. It will be your good friend, when you make some stuffs based on Arduino/AVR. It could work with eClip programming Fixture together. XSP consists of 3 parts, you could use them according to your application. Note：DTR signal － If be enabled, high level default. 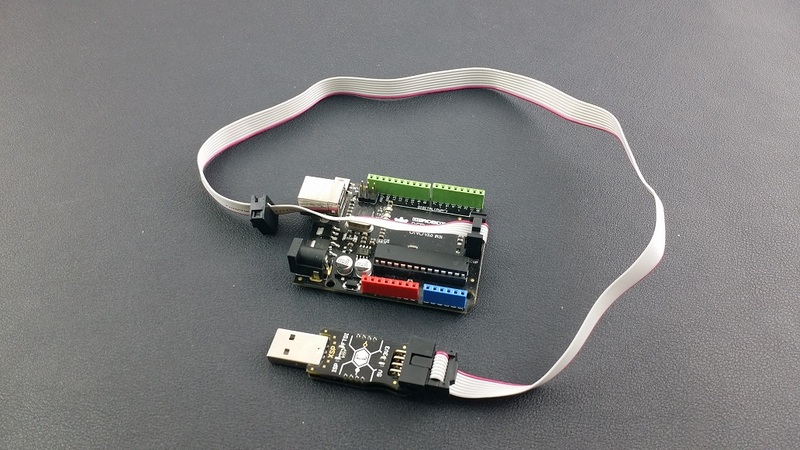 When you open the serial port, it will output a 50ms low pulse, which could trigger MCU reset even if there is no 100nf capacitance connecting to MCU reset pin. 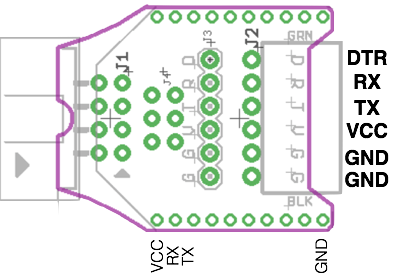 Note： FTDI doesn't include CTS signal, it is not used in Arduino. 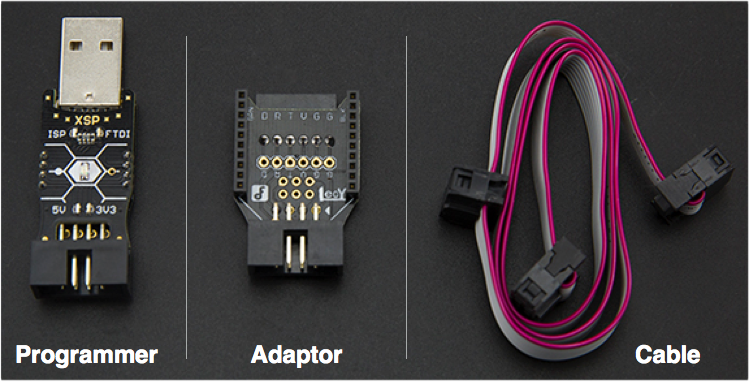 Connect Programmer, Adapter, eClip .etc. Note： You could config XSP function through serial port. Since it doesn't need to config its parameter frequently, we did following constraint to improve its work efficiency. After each time you open the serial port, you only could make once configuration. 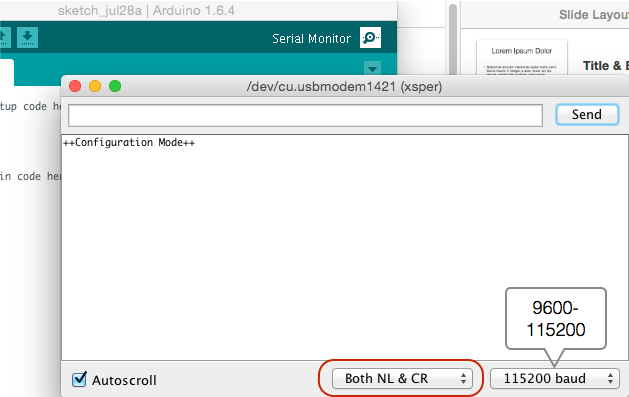 After you open the serial port, you can enter Configuration mode only if you input "NL/CR" before input any other characters. If you input other character, it will go into Work mode. If you want to enter Configuration mode again, you need to close and open serial port again. XSP could be configured by any COM debug tool. We will using Arduino IDE as our example. Note： During the configuration, as long as nothing is entered over 60s, it will exit the Configuration mode, and enter into Work mode. There are 5 indicator LEDs on XSP Programmer, representing its working condition. Note：When it is in Failure state, please open the Serial console to check the error information. Open the Serial monitor, set the right baudrate. 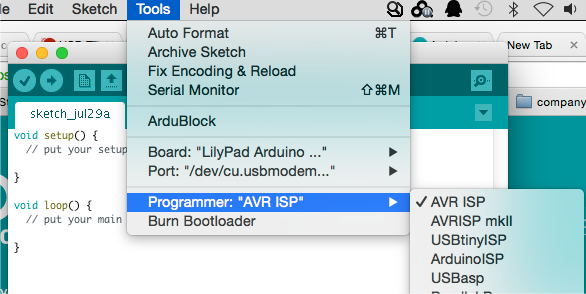 Open Ardino IDE -> Tools -> Programmer, Select "AVR ISP"
Note：AVR ISP is using Virtual Serial Port, so please do not open the serial port in the other way, or it will lose control; You need to close the Serial monitor, and powered off and re-up electricity to the device. 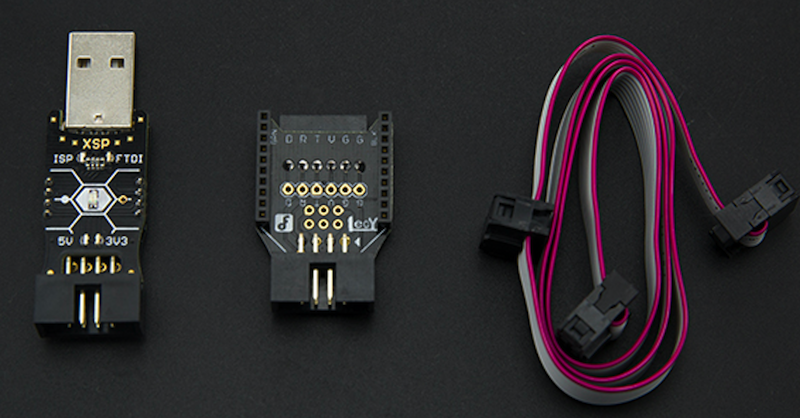 Get XSP - Arduino Programmer from DFRobot Store or DFRobot Distributor.